You are on vacation in this lovely area and you want to see as much as you can in the little time you have! Instead of a sightseeing tour…take a FLIGHTSEEING tour! With Sundance Helicopters at the Page Airport, you gain a completely unique perspective on the amazing landscape and features of this beautiful part of the country in state of the art helicopters which vibrate less and are quieter… Making your Flightseeing tour more comfortable and extra enjoyable! At Sundance Helicopters, their purpose is to enrich lives through awe-inspiring experiences. Their purpose focuses on three core values: 1) safety and security, 2) personalized customer experience, and 3) having the best team! 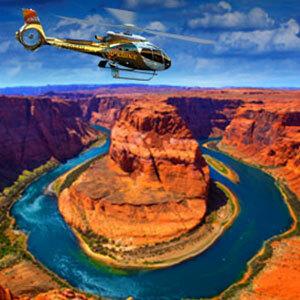 Sundance Helicopter tours is new to the Page area, but they are very well known in Las Vegas and California. Specializing in Flightseeing, Sundance also offers custom tours, charter flights, and group events along with special occasions like weddings. 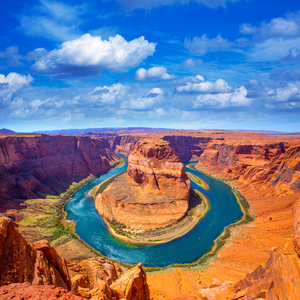 When you take a Flightseeing Tour in Page, you’ll get breathtaking aerial views of Horseshoe Bend, Lake Powell, Tower Butte and Glen Canyon Dam. 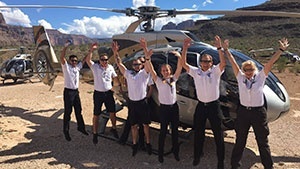 Sundance Helicopters actively serves by also providing life flight services as well as tours and charter flights. Important Details: The Leader in Safety Standards! Sundance Helicopters has the ability to constantly monitor and pinpoint the location of their helicopters 24/7 through its dedicated aircraft satellite tracking system. Going well beyond any FAA requirement for their type of operation, Sundance Helicopters implemented a formal Maintenance Quality Assurance program. The function of this dedicated QA program is to ensure that all critical aircraft maintenance tasks are thoroughly checked, double-checked, and properly documented. Along with that, they put their pilots and maintenance technicians through extensive education and training going well beyond FAA requirements. The quality of training is verified through rigorous testing, and followed up with performance monitoring systems. So feel safe, relax and take in the wonderful views from Sundance Helicopter Tours at the Page Airport!